Frequently asked questions, and a few words about us. 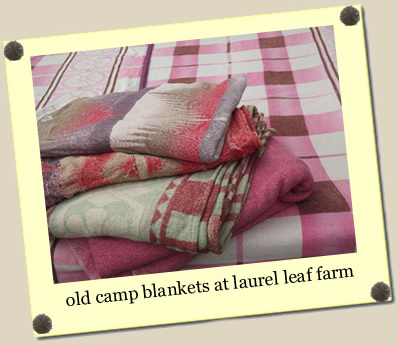 Thank you for visiting us here at Laurel Leaf Farm. It's thanks to you - our valued customers - that we're one of the largest single seller antiques sites on the internet, in business since 1999, with hundreds of one of a kind vintage items for sale. Our philosphy - Good old things from good old times, that's what vintage means to us! And although pieces you collect or seek out to replace a lost favorite from days gone by can be priceless to you, we like to give our customers the most affordable pricing possible. That means plain old fashioned service and fair prices everyday, no gimmicks or haggling required. - and our philosophy about packing. We believe in 'green' and always have. 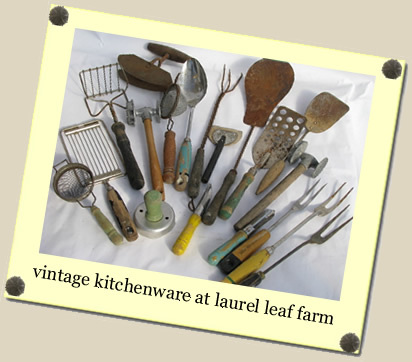 We do our best to reuse through vintage items, and reduce and recycle through careful, thoughtful packing. So you'll find our shipping cartons are recycled from our local big businesses, reconstructed and turned inside out for a nice neat package. And our fill is plain mill end paper where practical, bubble wrap and peanuts made from recycled polystyrene where needed. Keep it going, please recycle your packaging if at all possible. We don't have a shop to visit, we just sell online and ship your items out to you. Maybe someday! We're not currently scheduled for any shows or markets, as website work and orders are keeping us very busy. this is an international order - what's my shipping, and how do I pay? Shipping costs automatically calculated by our shopping cart are for orders in the US (lower 48 states) only, but we are happy to ship your order internationally. Just email us with what you'd like, and we'll weigh the package to give you the best rates by USPS. All applicable duties, fees and taxes are the responsibility of the customer. If you're unsure what this will cost, check out an online calculator for your country or contact your post office. We welcome snail mail orders if you want to send a check or money order for the total with shipping click here for US shipping costs. Please include your item number (s)! We've been getting requests for a print catalog, but don't have any plans to go paper at this time. want to place my order by phone. Our site checkout is protected by the highest level of SSL (secure socket layer technology) but sometimes it's easier to feel safer person to person. We can take your order with credit card number over the phone, though we don't have a dedicated order line. Send us an email or leave us a phone message with the item number(s), and we'll call you back to take your order. 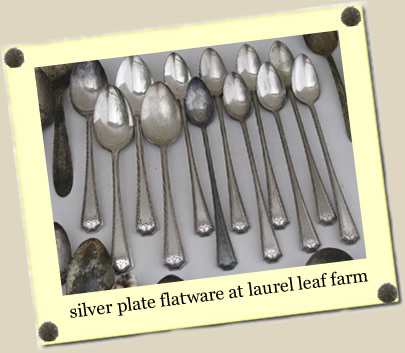 And for fastest service, email us at info@laurelleaffarm.com or orders@laurelleaffarm.com for item or order questions. Thanks! just ordered - it's not marked sold yet! We review and process all orders and update the website by hand, real people working without huge automated systems or bots - so it might take a day before the site is updated. We put top priority at getting your package packed and on it's way to you. when will I get my package? tracking number? We ship packages out every business day, usually UPS Ground or USPS Priority Mail as we ship some pretty large and / or heavy packages. Our items aren't pre packed and so shipping might be a couple of days or even a little longer for things requiring a lot of packing. You'll probably receive a tracking number email through UPS or USPS, though you're welcome to email us if you just can't find it! We are happy to try to do everything we can on our end to get your package to you as soon as possible, however! 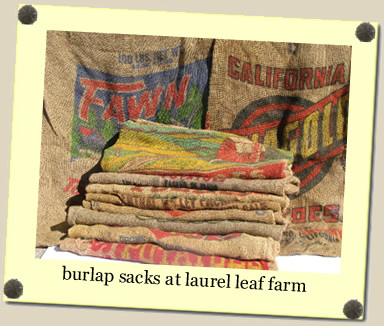 Please email us about rush orders - the fastest way to reach us is by email at orders@laurelleaffarm.com - thanks. Here's a link! gift cards. Just choose the dollar value that you'd like and place your order - we'll send an email 'card' to the recipient and copy to you. It's that simple. or a gift package - no invoice included? No problem, we'll send your gift package without a price on the packing slip, just let us know it's a gift when you order. Sorry, we can't gift wrap as it would be nearly impossible for most pieces. It all ships nice and neat in a recycled brown corrugated carton, and we're happy to put a note right on the shipping label for you. You've come to the right place! Please see below for frequently asked questions. I want something exactly like one I see marked SOLD. Help! 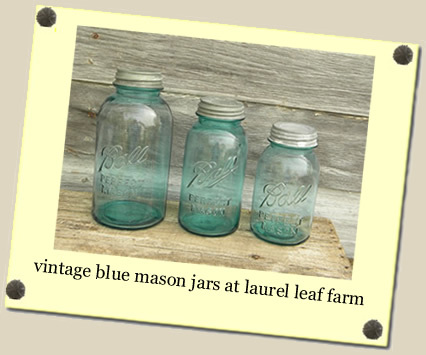 Oh, how we wish we could go back in time and order a truckload of our most popular pieces! But we can't, and have to make do hunting out and buying customer favorites and things that have sold whenever we find them at a good price. So sometimes we do find another, but if it's showing as sold we have no more at the moment. Sorry. what's a redemption code, and how do I find a coupon? The 'redemption code' field in the shopping cart is the place to fill in gift card codes, exchanged product codes and very occasionally coupon codes available to our previous customers and email list subscribers. It's not one of those things where every day there's a new coupon for 25% or 40% off like so many big stores. We keep our prices pretty much as low as we can all the time, so you don't have to worry if you don't have a coupon. the mailing list - when do you have sales? and how do I get first notice? You can join our mailing list here, and rest easy knowing you're not going to be spammed with a new 'sale' every couple of days! We'll keep you up to date with any major website changes, and sometimes a few emails with product photos or a little discount. But mostly, we're nice and quiet - and we'll never sell or share your email and info. We don't have a sale section or run constant 'clearance sales' - since we have only one of a kind items, it seems as though there's really not a lot of point in clearance when there's only one of every listing to begin with. Sometimes we just adjust the item price a little instead, and sometimes pieces come home with us! 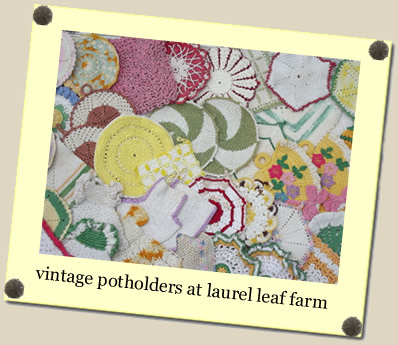 We list vintage items a couple of times a week as the other work permits, but we really don't have an exact schedule. Some of our latest listings are shown here, so watch this page if you want to get pieces ahead of everyone else - it takes a couple of days for listings to show up in the search engines, and so you'll have a head start by checking right on our website. We seldom have replacement pieces, since we sell nearly everything one of a kind. But all of our shipments are fully insured. We'll just need you to finish opening and inspecting the package and then email us photos of the damage. With multiple item or multi-piece orders, we'll also need you to tell us what is (or is not) damaged. But once we have the photos and an itemization, we're usually able to issue your refund right away, directly to the credit card or paypal account used for payment, and you shouldn't have to return anything to us. We'll always be in contact with you over any damaged shipment and please hold onto the entire package contents (including all packing materials and shipping carton) until you hear from us. We accept returns for any reason, and you're welcome to return your order (in the same condition sold) for a refund. Please contact us to let us know you're returning a package, and ship the package back to us within 15 business days - we'll issue your refund as soon as we receive the return. Original and return shipping costs are non-refundable in most cases, please contact us if you need further info, or see the link below for return policy details. click here for our complete return policy. 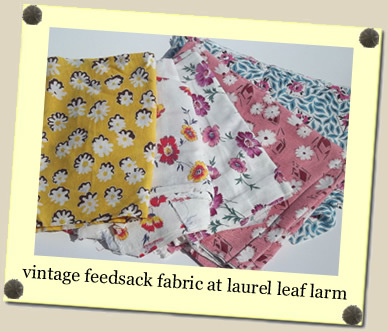 If you'd like to exchange an item you've ordered from us for something else on our website, please email us at info@laurelleaffarm.com. We can't exchange your item for another of the "same" item (ie. different color, size etc.) because all of our items are one of a kind, but you're welcome to return the item to us and we'll credit your refund toward the purchase of the another item. Please give us a item number or order number if you're writing us a note or leaving us a message, it makes everything so much easier and faster. No text messages, sorry - we have very spotty cell phone reception in this hilly farm country, and our phone number is an old-fashioned land line. 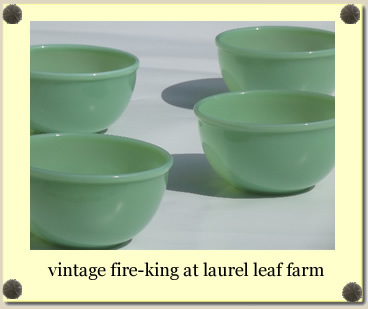 Call 920-295-3331, or for fastest service, email us at info@laurelleaffarm.com or orders@laurelleaffarm.com for item or order questions. Thanks! What's this thing, and what's it worth? We're very flattered by all the attention - but can't really help you here, as we're not certified appraisers, and we're not really 'experts' on anything - just long time collectors with a passion for all sorts of junk! 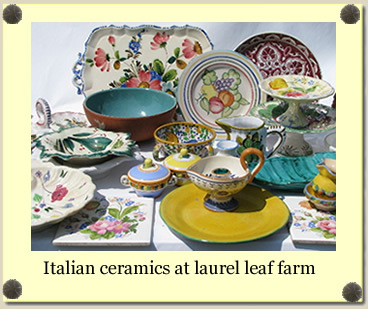 But you're very welcome to browse our items and sold items for pictures and identification for any help that might be. Do you buy this sort of thing? We get lots of emails and phone calls from people with vintage pieces to sell. 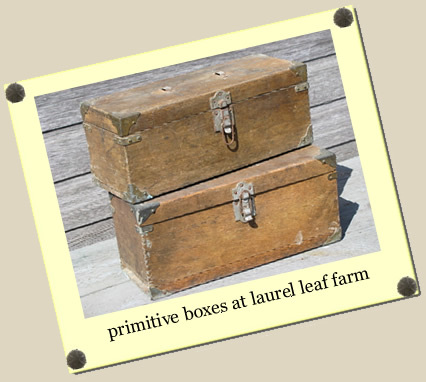 But we currently buy all of our stock locally, as the midwest is a wonderful hunting grounds for the antique and the odd and unusual, and we're able to buy quite a bit - more than we could ever list - from our area pickers and dealers, as well as estates and farm sales near us. MANY THANKS TO ONE AND ALL FOR YOUR INTEREST!